Simply the best Plasma / LCD TV stands on the market. Plasma TV or any flat screen TV can be safely mounted and free standing anywhere! Will support loads of up to 130 Lbs. and screens up to 60"
Don't be fooled by claims of strength and stability with other models on the market. Buyer beware! Available in any height. 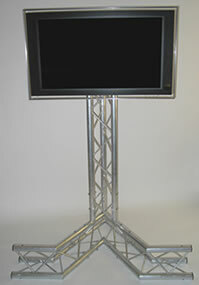 Learn more - click here for PDF - about LCD Plasma Stands. 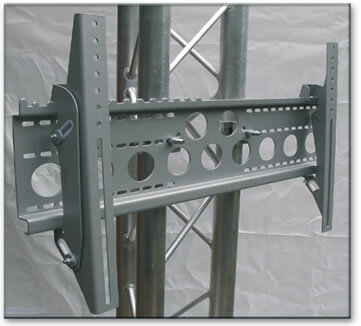 This mount bracket will attach any Plasma , LCD or flat screen to 2" truss tube within seconds. Tilts with ease and comes complete with all hardware and instructions. With the huge new interest and use of Plasma and LCD Tv's along with flat screen monitors we set out to design a cost effective, safe and stable solution for a flat screen tv stand. This turned out to be a challenging task. The weight of these new Plasma tv's and LCD screens was surprising to say the least. We quickly found that making the best LCD stands was not going to be easy. 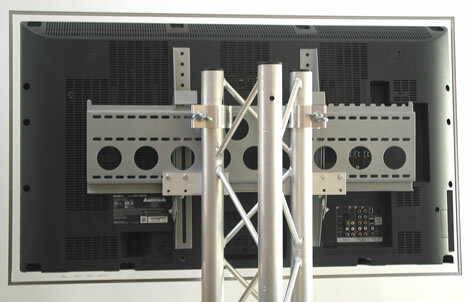 Most customers had been asking us to provide for them designer Plasma tv stands at heights of approximately 5 - 7 feet. 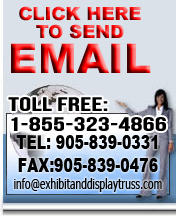 After a long round of market research in the Exhibit and Display Industry along with Trade Show and Conference supply companies we found two things. The best LCD tv stands or Plasma tv corner stands out there were only 2 - 3 feet high and were usually made of wood like furniture. We also found whalen plasma tv stands and other tv stands maple plasma to fall far short of the goal when it came to providing a stable, light weight, and attractive designer plasma tv stand. We set out to make the best TV Stands around. We learned that customers wanted a strong, high tech flat screen television tv stand that would be portable and ideal for use on the trade show floor and for use in any public venue. Safety and ease of assembly would be important as always. 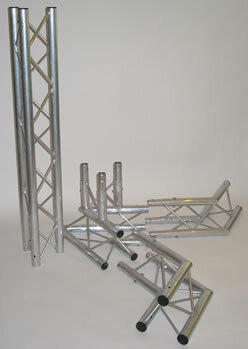 Fabricated with 10" 3 chord aluminum truss like our world famous Exhibit and Display Truss structures, these amazing LCD stands or plasma stands simply rised above any other on the market. Trade show displays and Exhibitions can now safely have Plasma and LCD tv's stand free in the air with out the worry of the flat screen monitors being knocked over or pulled down. The best lcd tv stands are here and at a price that is more than competitive with other maple or wooden furniture type lcd tv stands. Our Plasma, LCD, Flat screen monitor stands are available in any eight and can support the largest screens on the market with no stability issues. They are string and stand straight and high. 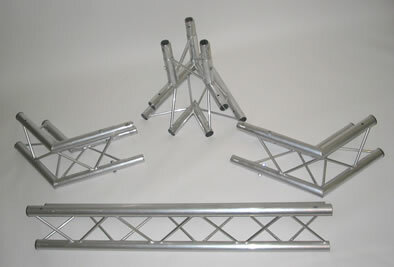 Easy to assemble and take apart, the stands are made using standard Exhibit and Display Truss components. These make for a stand alone product on a fantastic addition to our aluminum trade show display booths and exhibit booths. 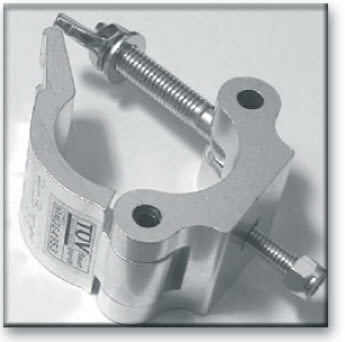 Add Single tube clamps to any standard Plasma or LCD monitor hanging brackets or mounting brackets. These will provide a fast and strong method of quickly attaching your flat screens to the stand. If you are looking for an inexpensive method of mounting your plasma or LCD tv or flat screen monitor these are the best lcd tv stands out there. Contact us with any questions as we would be happy to assist you.